The Prime Minister,O’Neill has announced a change in Cabinet portfolios that will better position the National Government to take advantage of current and emerging development opportunities. “There are a number of important projects underway as well as emerging opportunities for our nation that require the adjustment of ministerial focus and enhance the effectiveness of Government processes. “Among these are the new LNG project by TOTAL SA and the development of the P’nyang gas field by ExxonMobil, emerging transportation infrastructure projects and a wealth of new tourism opportunities. • Hon. Steven Kamma, Minister Assisting the Prime Minister on Constitutional Matters. The Prime Minister said minor changes to Cabinet positions are important in order to maintain administrative flexibility as the global and national economy evolves, and to ensure ministerial skills and capabilities are well targeted. “Minor changes to Cabinet positions are important in the Westminster system, and our Government is careful that when we do make changes enhance Government capability. “Most of our ministers are in their positions for extended periods so as to enable them to fully advance their departments, while ensuring stability. “Petroleum and energy is one of the most substantial elements of our economy for ensuring future development and jobs,” PM O’Neill said. “Ben Micah brings a wealth of experience to the portfolio particularly considering the careful manner in which he delivered the restructure of Kumul Petroleum holdings. “Our state owned enterprises are a particularly important component of our economy and national development plans,” the Prime Minister said. “We have seen a marked performance improvement in the capacity of our SOEs in the past three years under Minister Micah’s leadership. “This has involved major steps forward in service delivery and the declaration of dividends to the State. “The effective planning and delivery of transportation infrastructure is very important for Papua New Guinea and vital for our economic growth and expansion,” PM O’Neill said. “Minister Duban is very well aware of the challenges that we face in expanding our transportation infrastructure and is very well placed to ensure this is delivered. “Tourism is a sector that has huge potential for Papua New Guinea but we need to advance this sector in a very deliberate and strategic manner. “The Government has already advanced the tourism hub concept that will deliver new developments for Alotau, Madang, Kokopo, and Mt Hagen and other centres. “The success of the Pacific Games is testament to the capacity of Minister Tkatchenko to deliver major international developments for Papua New Guinea. 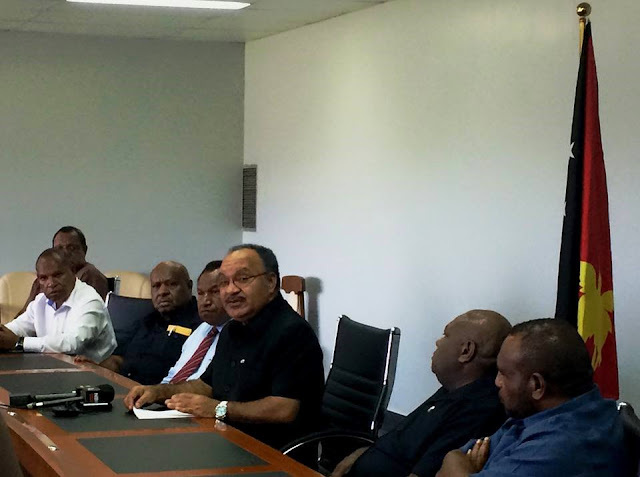 The Prime Minister said he will take on responsibility for Bougainville Affairs, that he said is a top priority of the National Government. “Since coming to office, advancing the peace process and continuing to expand service delivery on Bougainville has been an essential part of our Government. “We continue to extend special budgetary support, and build new infrastructure that is needed to move economic development forward. “Honourable Steven Kamma needs to attend to his personal matters but will continue to support me as Minister Assisting the Prime Minister on Constitutional Issues.